This SOLO GSP80-83013 disposable 9 oz. 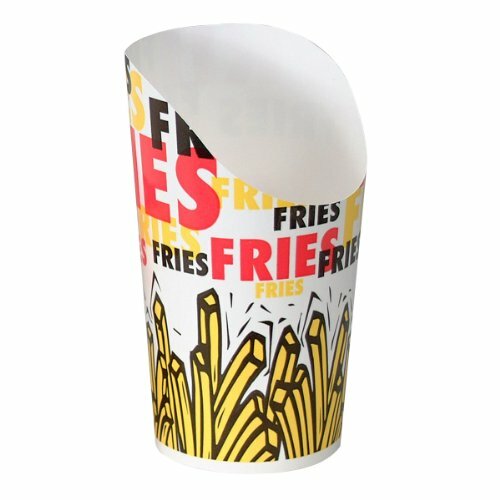 single-sided poly paper cup with Scoop Fries print is suitable for serving French fries, snacks, and other hot and cold food items. It has a polyethylene lining for resistance to butter, grease, and moisture penetration. This paper cup has a scoop-shaped rim to facilitate filling the cup with food items without using a kitchen utensil. It is 6" high and has a 2.8" base diameter. Disposable food service products are used to store, insulate, transport, prepare, and serve food and drink. They may be made of paper, plastics, or metal foil. Food service products for freezing items protect their contents from freezer burn, contamination, and drying. SOLO manufactures disposable plastic, paper, foam, and post-consumer recycled content cups, plates, and other products for food and beverage service. The company, founded in 1936, is headquartered in Lake Forest, IL. If you have any questions about this product by Solo Foodservice, contact us by completing and submitting the form below. If you are looking for a specif part number, please include it with your message.